Captive was a surprising sequel. When I began reading I thought I knew what was going to happen but then everything was turned on its head and I was genuinely surprised with the turn of events. 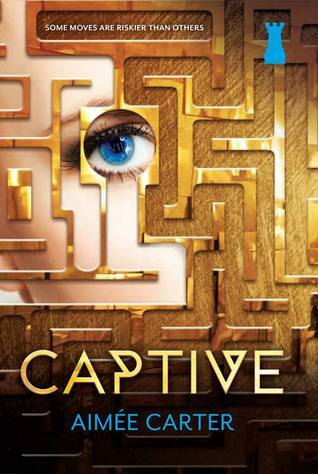 This was my favorite thing about Captive; I never knew where the story was going to take me. In my review of Pawn I said that Kitty was likable and fun to read about because her views of the world were constantly changing and I didn’t know what she would do next. In Captive she became somewhat less likeable. Kitty was constantly putting herself in the worst situations and endangering the lives of those round her. Her actions didn’t make sense so I had a hard time believing the events of the story. Then there was Lennox Creed which is without a doubt the most badass character name I’ve read all year. I really liked him in the first book but in this installment Knox became even more secretive, manipulative, and I couldn’t understand his motivations. I think Kitty was right to question his actions. I just wish that the questions she had asked led to more answers. Readers will be happy to know that there is no love triangle in this novel. Kitty is very serious about her boyfriend Benjy who gets a little more page time in Captive. But once again I didn’t care all that much about the love between Kitty and Benjy because I didn’t get to know Benjy. He was more of an idea than a real character. Overall, Captive was a good, but not great, sequel. Despite surprising me a few times a lot of this story felt like something I’d read before. I think that’s the problem with dystopian stories in this market, everything, even if it is original, has a similar tone so it feels the same. Despite the familiarity though I will be reading the third book in this trilogy because I want to know what happens to Kitty, Knox, and the Blackcoats. I find your review so interesting. I'm debating though if I want to continue with the series. I found the first book to be subpar and even though The Captive sounds good, but I'm wondering if I want to invest in the time to continue on with the series. "Good, not great"...I don't know, I'll guess I read some more reviews to figure out if The Captive will pique my interest.